One of the first things you notice about the city of San Francisco is the undulating streets. It seems like it was this city that inspired theme park roller coaster rides with steep dips and rises. 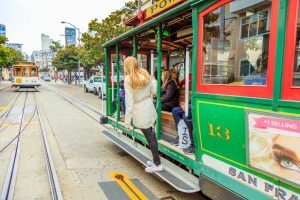 A tram ride in San Francisco is more about the ride than the destination! 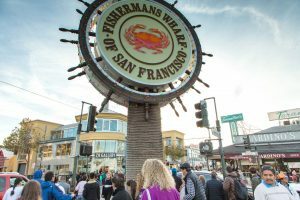 For accommodation, it’s wise to stay in the city area, either near Union Square or Fisherman’s Wharf. 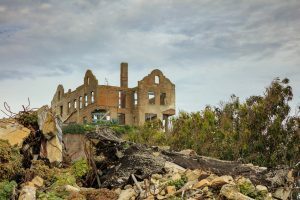 From these locations, everything is close and easy and the need for a hire car is questionable, particularly as traffic and parking are tricky so best to try and avoid. And as far as food, there are so many places to choose from for all budgets so being in these central locations, gives a lot more choices. San Francisco has an abundance of history, interesting architecture and fascinating streets. It makes for great cafes and restaurants as well as plenty of places to visit. 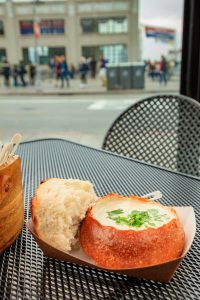 You feel like a child wandering around the streets in awe not knowing where to look next, if it’s not the hustle and bustle of Union Square, it’s the streets, local people or the endless attractions to visit. 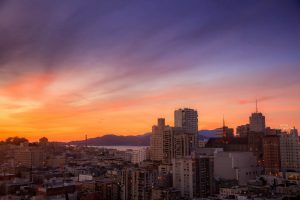 Alcatraz – easily the number one thing to do when visiting SF, although I must admit that prior to my visit, I booked a trip over to Alcatraz more because I felt like it was expected rather than I was actually that interested in going. Having said that, I could not have been more wrong in my assumptions. 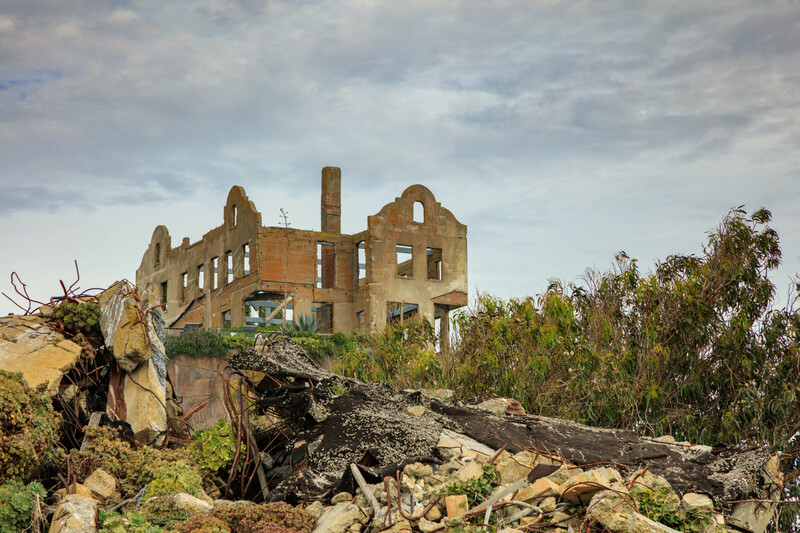 Alcatraz Island is an experience from the moment you board the ferry over. One of the highlights of touring the island is the audio tour of the jail cells. 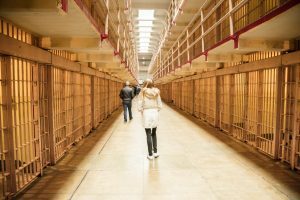 It allows you to have your own personal guided tour, set at your own pace and many of the narrators are original staff or prisoners. The history and details are fascinating from witnessing the actual cell from “Escape From Alcatraz” to visualising up close what it was like to live on the island during its days as one of the Americas most infamous prisons. 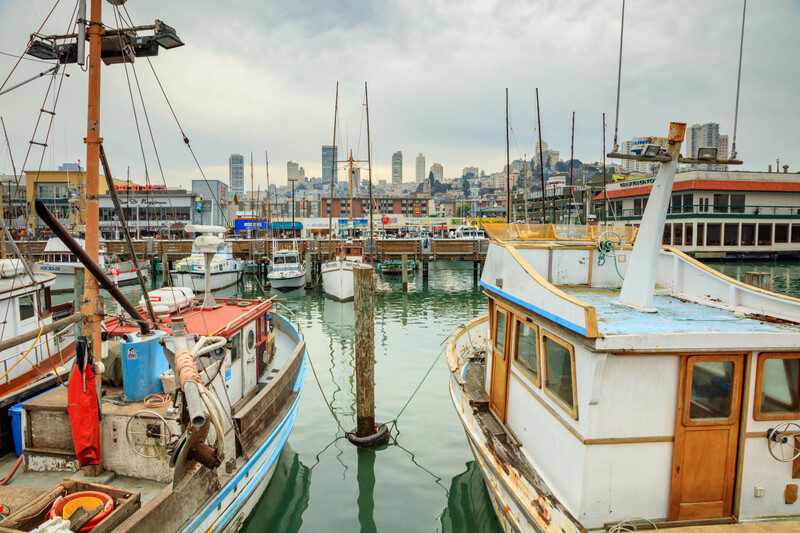 To visit Alcatraz, it’s a short 15-minute ferry ride from pier 33 on the Embarcadero. It costs around US$40 per person. It’s best to book early, firstly to utilize the early bird prices but also it gets very busy and particularly during peak times, you must book in advance or risk missing out. The Painted Ladies – maybe it’s just me, but the Painted Ladies was one of the highest on my bucket list of places to visit in SF. 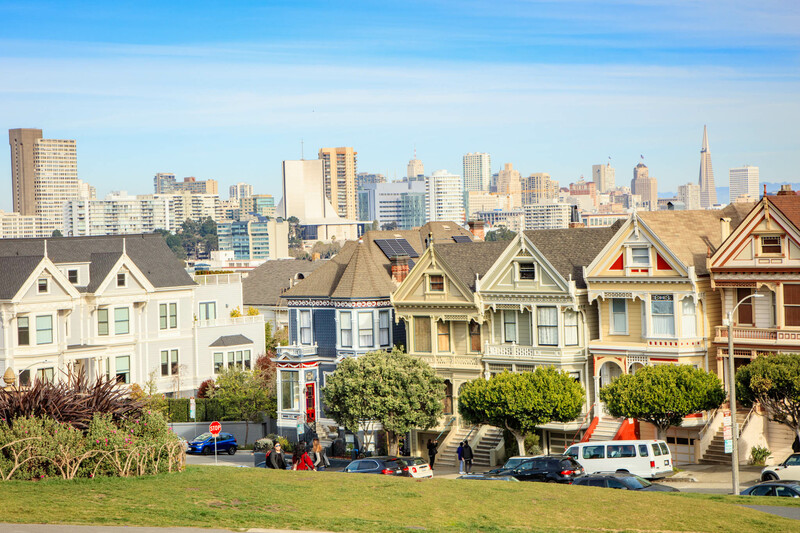 Not only are the painted ladies the quintessential architecture of SF buildings with their cute row of townhouses on the hill at Alamo Square with the SF skyline in the background, they have featured on many TV and film productions including of course, Full House, so it’s likely you will know this street well. 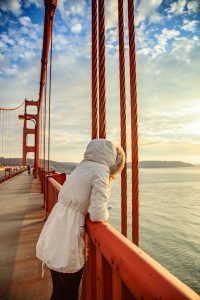 Golden Gate Bridge – Of course you cannot visit SF without driving across, riding across or viewing the beautiful Golden Gate Bridge. It is probably the “Opera House to Sydney” that the Bridge is to SF. One of the things that makes it so unique, photogenic and recognisable is the orange colour of the bridge. Originally, the orange was a temporary primer colour to protect from corrosion, but the consulting architect decided it was not only more visible in fog in the orange colour but was more aesthetically pleasing to its surroundings, so the colour remained. 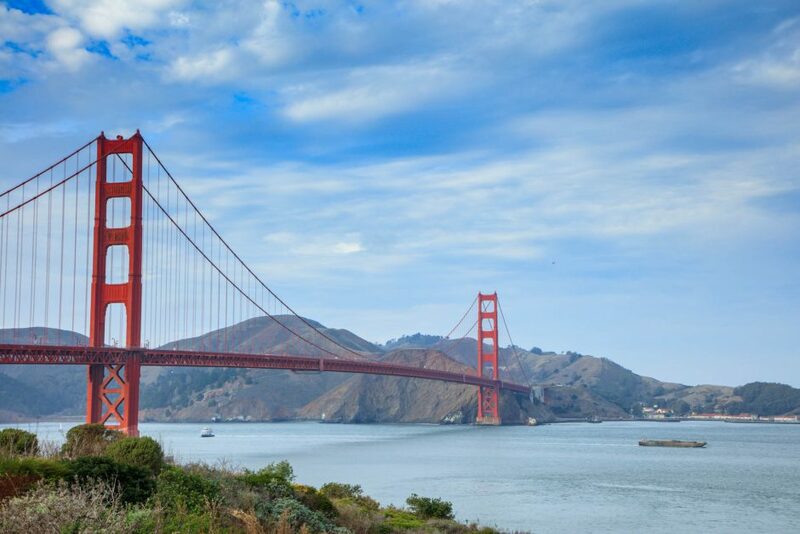 Lucky because seeing this bridge makes you wonder why more cities didn’t follow the trend. 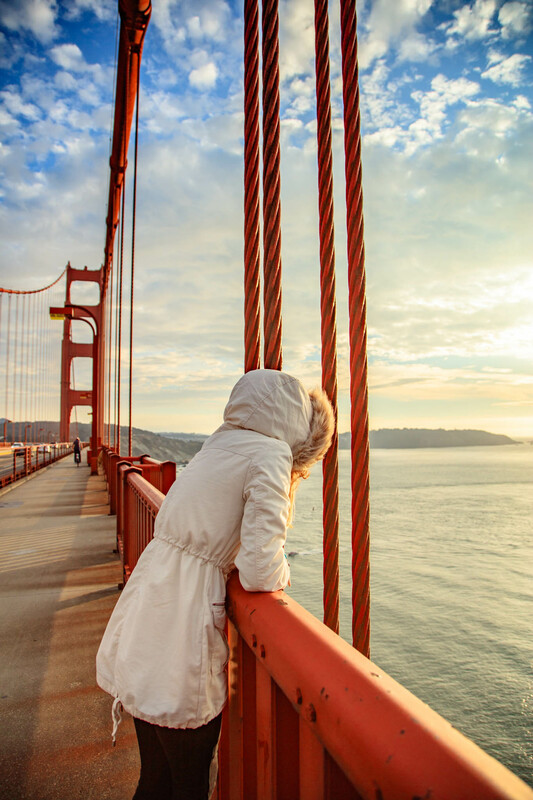 One of the most idyllic vantage points for views back to san Francisco is Fort Baker, but easily the best way to experience the bridge and the incredible views is to hire a bike and cycle over. I hired bikes from Sports Basement on Old Mason Street at a cost of US$24 per person for 3 hours. It’s such a fun experience and there’s so many spots to stop on the way for a picture or to take in the view. Fort Rock Point and Vista Point are other great places along the way to view not only the bridge but the views. 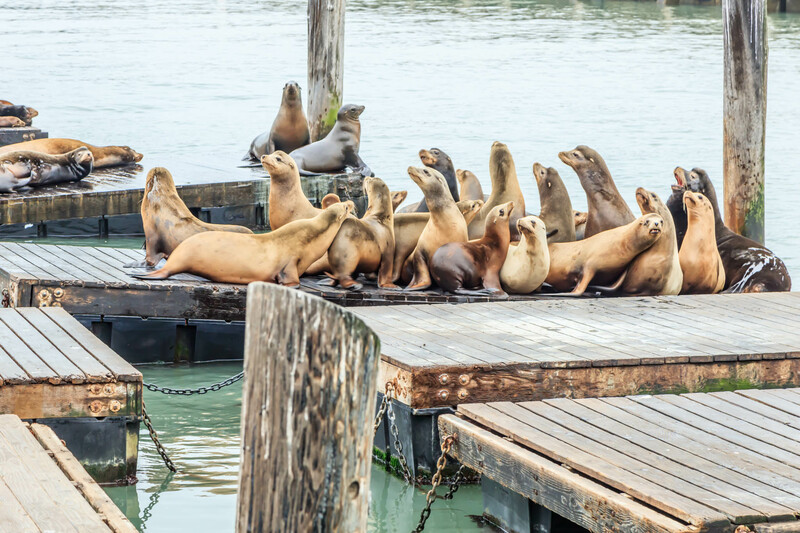 Pier 39 Fisherman’s Wharf and the Sea Lions – the whole area of Fisherman’s Wharf is a colourful, noisy, exciting place to visit. 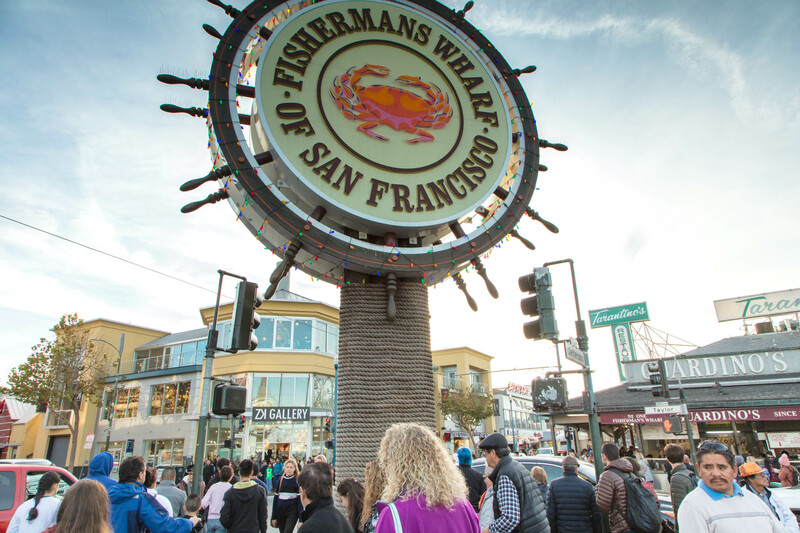 This was one of my favourite areas of SF because everywhere you looked, there was something entertaining to see or do. With lots of quirky little stores with everything from local souvenirs to one of the best sweet stores ever, to market style food stalls. 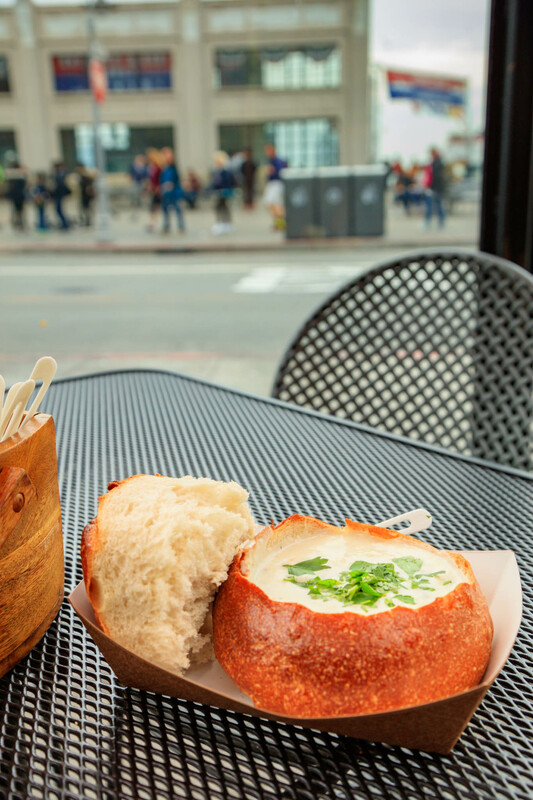 One thing you must must try whilst visiting the wharf is the SF famous clam chowder in a whole sourdough loaf. You can pick up one of these for under US$10 from a market store or if you fancy something a little more special, most of the restaurants in the area sell this famous gastronomical delight. 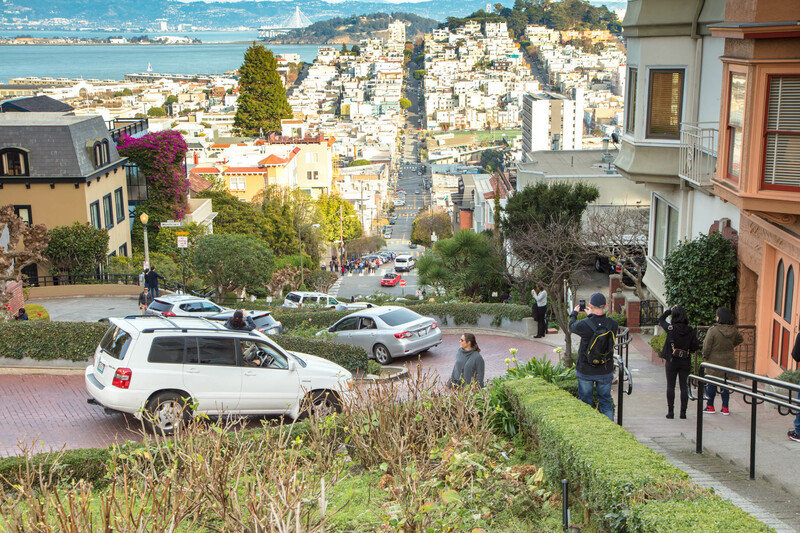 Lombard Street – this is somewhere that was on my bucket list. It’s the worlds windiest street as well as being extremely steep. I’ve seen some amazing pictures of it and wanted to see it for myself. But if I’m honest, yes I’m glad I can say I’ve been there, but if time is short, its probably last on my must do. You don’t get a great view as the street is so steep, and if you want to drive down it, the traffic and queues waiting to enter the street are exhausting so are probably not worth the time. 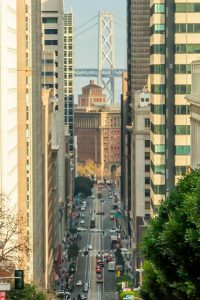 I would much rather meander through the surrounding streets and down to the Bay. Muir Woods about a 30-45-minute drive (depending on traffic) north of SF is a large forest known for its huge redwood trees some of which are over 1000 years old. Muir Woods are also historically significant as in 1908 President Roosevelt created the Muir Woods National Monument. These woods, as with many of the popular tourist attractions, get very busy though so plan ahead. It’s usually best to travel either early, or late in the afternoon. An entry fee of US$10 for adults and quite strict rules about food in the park etc so check their website if you are planning to stay for any length of time. Sausalito just across the Golden Gate Bridge is a cute little seaside village that you can get to either by continuing on from your bicycle tour of the bridge, or incorporate with your visit to Muir Woods as its one the way. With enchanting boutique shops, cafes and galleries, it’s a lovely place to spend a lazy few hours. The views back to the city are spectacular and one of the best things about this little town is it’s fairly quiet. Wander along the boardwalk, find the houseboats synonymous in this area and just take a general break from the city. 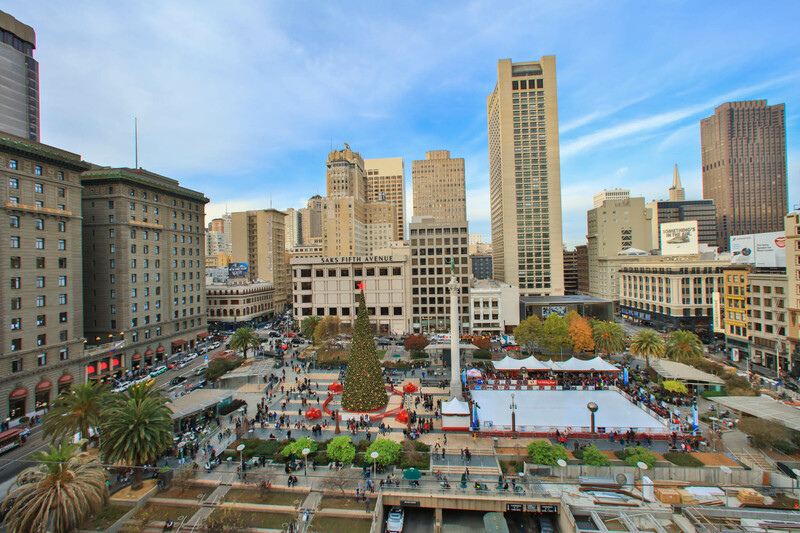 Ice skate in union square – depending when you are visiting SF, from November through to the end of January, there is an ice skating rink erected in Union Square that is a must do. It’s a magical feeling of skating outdoors in the winter time with the giant Christmas tree towering above the rink. 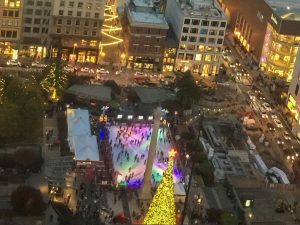 It does get busy and can be a bit crazy on the ice with all the varying levels of skaters, but it’s such a fun thing to do and fairly unique, the only other place I can think of doing this is New York. As a bit of advice, before you go booking one of the tours to take you to all the tourist attractions, be aware. 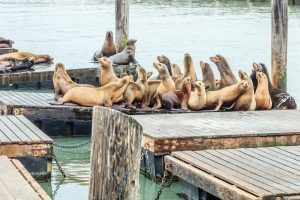 Depending on when you travel, these tours can get ridiculously busy and tour operators don’t seem to cap the numbers. I booked one of the open top bus tours where you pay for a 24-hour ticket and can hop on and off the bus as many times as you like. There are multiple busses basically circling the same route each day so in theory, it’s a great idea. However, on the day I chose to tour, I paid US$165 US for a family of four and found that the busses were so crowded, we couldn’t get a seat on the top deck in the open air (a waste of time being inside downstairs as you could hardly see anything and definitely not take pictures) and then often, we were waiting 30 minutes or more for a bus. In the end, I gave up and used Uber to get around to each location. A really cheap and fast option. Never waiting for more than 5 minutes for a car, and after a day of travelling around, came out way ahead of the US$165 bus cost. If you do your homework and work out what attractions you want to see, I think this is a far better option for travelling around. In fairness to the company, when I complained about our experience, they refunded our money with no arguments. 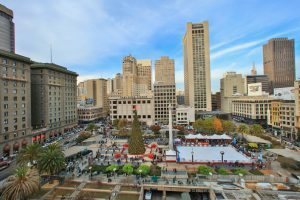 Finally, don’t forget San Fran is the home of Silicon Valley and some of the major world tech players like Google, Facebook, Instagram etc. Although many of these are not open to the public, it is still an interesting day trip if you have the time. Google allow you to walk around the campus grounds and get a feel of the quirky site. Intel has a museum and EBay a souvenir shop. Facebook and Instagram sadly are off limits unless you “know someone”. Previous What Are You Really Worth?